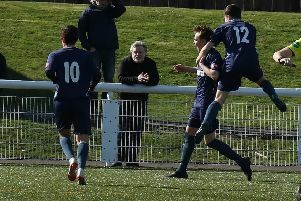 The first round of the Tweedie Cup takes centre stage this Saturday with six cup-ties scheduled to be played along with one South of Scotland League match. In the cup competition there are some very interesting ties in prospect with the match at Lockerbie between Mid-Annandale and Wigtown and Bladnoch looking particularly mouth-watering. Mids are on a good run of form at present and are expected to push their visitors all the way in a contest that could well take more than the regulation ninety minutes to find a winner. Crichton again travel up to Sanquhar to play Nithsdale Wanderers and will start the match as slight favourites to progress although the home team will have different ideas and will as usual give off their best to try and take something from this tie. Abbey Vale play Heston Rovers in a local derby match in another game that could well go close with home advantage possibly being the deciding factor as to who progresses to the next round. Dumfries YMCA are threatening to give a team a going over so Upper Annandale will have to be at their best to make round two but this might just be the day that the YMCA teams fortunes change and they make progress in this particular cup competition. With home advantage favouring Lochar Thistle they are expected to overcome a Fleet Star side who are finding life difficult at the moment although this is another tie that could go close. St Cuthbert Wanderers travel the short distance along the A75 to play Newton Stewart at Blairmount Park and if league form is any guide the Kirkcudbright side will go into this game as favourites to progress. However league form sometimes goes out the window when cup matches are played and a young Newton side will be well up for this contest against a vastly more experienced Saints team to try and prove the form book wrong. The only league match being played is at Galabank, Annan where an in-form Creetown side who also field many young players will attempt to try and overcome a highly skilful and experienced Edusport Academy team who lead the league at this point of the season. Edu on the other hand have the opportunity of opening up a much larger gap at the top with all their nearest challengers playing cup football and will be strong favourites to do so come the end of this encounter.